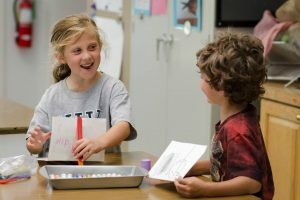 The Social Thinking Program at Centreville Layton School is modeled after the work of Michelle Garcia Winner who states, “Improving one’s social thinking will help to improve their social skills (social behavior), reading comprehension of literature, written expression, narrative language, playing with peers, working as part of a group, forming peer networks, etc. Much of what we do in school, at work, and as part of the community requires understanding the perspectives of other people and thus – social thinking.” Students learn skills to be flexible social thinkers and social problem solvers. They learn about their own social behavior and strategies on how to regulate it. Concepts and strategies are taught using a multimodel approach through classroom instruction and individual intervention. These lessons are then reinforced by teachers/staff during “in the moment” situations.